Joseph Calabrese is a freelance screenwriter. He was one of the winners at Slamdance Film Festival in 2004 for his religious thriller Second Coming and, as a result, has received interest from several producers. His action fantasy script The Eyes of Mara has recently been adapted into a graphic novel entitled Her Majesty's Bulldog Brigade, with art by Harsho Mohan Chattoraj and Brendan Keough, published by Chimaera Comics. 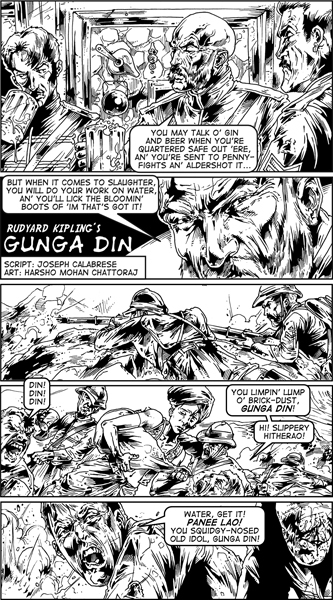 The "Gunga Din" short comic is a spinoff from that project and features characters found in HMBB. Visit bulldogbrigade.com for more info on the project. Harsho Mohan Chattoraj is a graphic novelist and illustrator based in Kolkata, India. He's worked in the comics medium for seven years, on individual projects and for clients in India, the UK, and the US. His comics published in 2009 include Operation Military and Charlz of Marz, both published in the US, and Around the Swiss World in 20 Days, published in India and Switzerland. Harsho also has work experience as a journalist, visualizer, storyboard artist, voice-over artist, and promo producer, but has always been a fan of comics, since his first dosage of Asterix at the wee age of five.